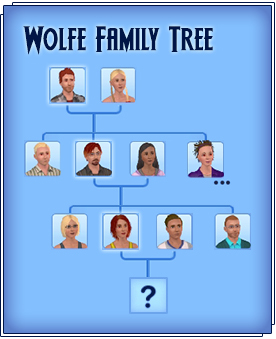 Cascadia Wolfe: Third child of Alex and Roxanne. Status: Elder. Niobe Wolfe: First child of Virgil and Keri. Status: Adult. Serefina Wolfe: Second child of Virgil and Keri. Status: Adult. Prometheus Wolfe: Third child of Virgil and Keri. Status: Adult. Brady Davies: Spouse of Serefina. Status: Adult. Hyperion Wolfe: First child of Serefina and Brady. Status: Toddler. Deo Wolfe: Second child of Serefina and Brady. Status: Toddler. Belladonna Wolfe: Third child of Serefina and Brady. Status: Taco-baby.